The show of force demonstrated in front of Nipissing MPP Vic Fedeli’s North Bay office on Wednesday by union leaders in the hospital sector is just the beginning. 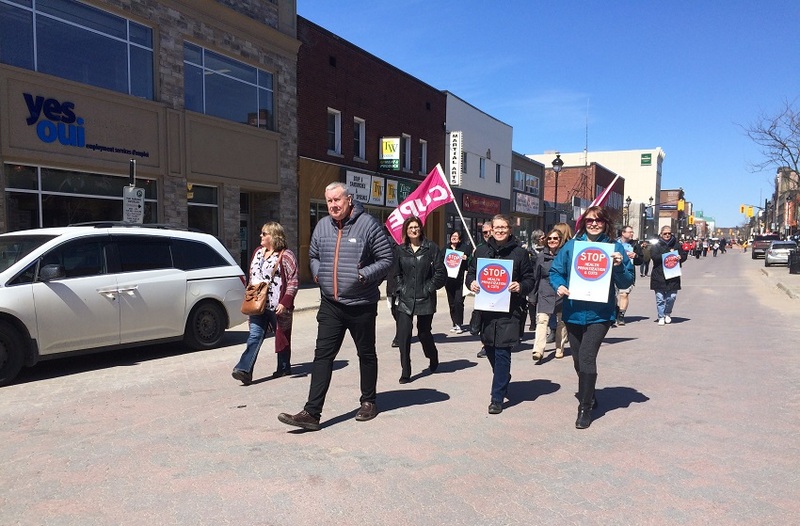 The union leaders were in North Bay for an annual health conference then rallied outside Fedeli’s office at noon Wednesday to protest the Ford government’s plan to restructure the healthcare system. 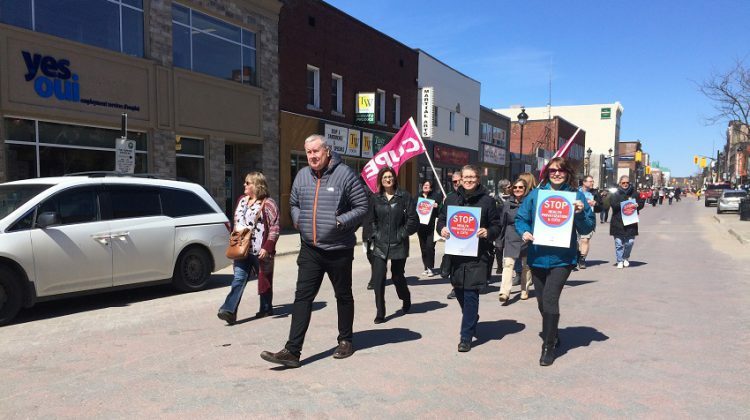 Heather Duff, who is Chair of CUPE Ontario’s Healthcare Sector says as the Minister of Finance, Fedeli speaks in many towns and cities. She says as Fedeli holds events, the Tory MPP can expect the occasional protest to follow him as well. 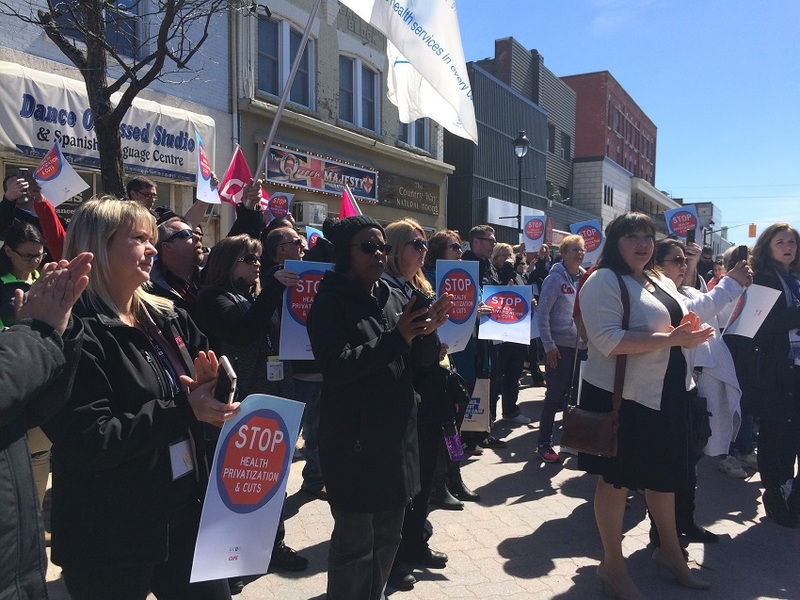 The North Bay noon protest was one of the larger ones because of the sheer number of healthcare hospital-related trade unionists the conference attracted with well more than 100 people taking part in the rally which blocked motor vehicle traffic. But even that will pale in comparison to a major rally at Queen’s Park planned for April 30th. Duff says more than 30 buses from different parts of Ontario are heading to the end-of-the-month rally and one of those buses is from North Bay. “We haven’t had a bus (from North Bay) in a while,” Duff said. Duff says North Bay residents who want to be part of the April 30th demonstration can contact the North Bay and District Labour Council. 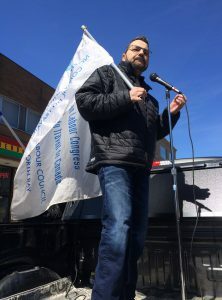 Well-known labour activist Henri Giroux was one of several speakers to address the crowd protesting outside Nipissing MPP Vic Fedeli’s office over healthcare cuts. For information, call either Henri Giroux at 471-7746 or Jared Hunt at 845-8265.